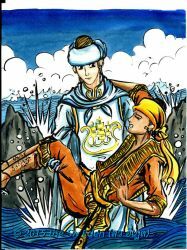 ♥ <<Previous Part "Loading Page and Intro"
After King Tabin accept “Save Nanda Bayin” duty from his sister, he begins to travel from the palace. 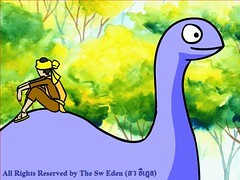 He needs to climb up onto the friendly long-necked dinosaur. This is because the dinosaur will know where is the other dinosaur’s place. 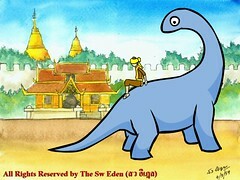 This scene, the user needs to use the right arrow on the keyboard to move King Tabin onto the dinosaur’s back. This part also contain the hint to use the keyboard at the first frame when King Tabin sits on the floor. “An army marches on its stomach.” a remember quote of Napoleon Bonaparte. Since this quote is true, the user needs to feed the long-necked dinosaur to keep it walks. When the mouse is moved into the leaf area, the scissors will visible automatically. When the user clicks it will cut the leaf, and from the user testing, everyone know that they have to put these leaves into dinosaur’s mouth; even someone spends couple of seconds to think about it.